Sunday, May 20 | Turning my world upside down! First off, I have to make a correction to a previous post. I kept mentioning Drummondville as the town near where my Dad grew up. I meant Victoriaville. We did go to Drummondville on Friday night for dinner and the campground we stayed at was in that region – Camping des Voltigeurs. So I’ve gone back to correct that on the original post. On Sunday, we had a few things left to do on our agenda. Our weekend was considerably shortened by Leon’s good fortune on Friday. He won 2 very good tickets to the Ottawa Senators playoff game on Sunday night. We therefore knew we had to leave Quebec no later than noon in order to get to the game on time. 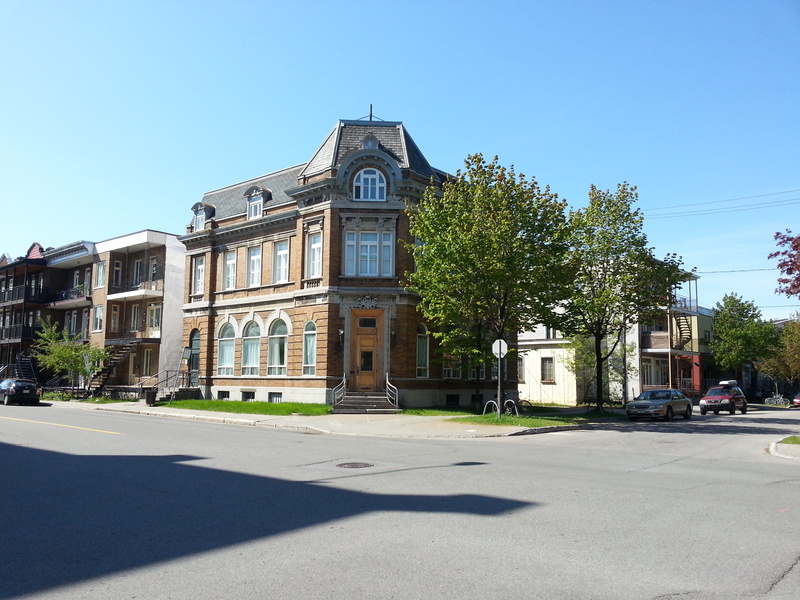 After a quick breakfast of good bread and caramel spread or blueberry jelly, along with some fruit, we drove back into Quebec City, direction Limoilou in search of some of my dad’s previous addresses. The whole process was complicated since we forgot our trusty GPS, Bruce, in my car, back at home. Yes, the smartphone has a GPS, but we were running out of juice quickly, so we used it as little as possible. Where Dad lived before he married Mom. We found the address where Dad had lived before enrollment into the Army – 503 4th Ave, what seems like a lovely apartment building. We then travelled to DeGaspé Street, where my parents would have lived while Dad was posted in Arvida, QC (1944). The address did not actually appear on the building, so I can only guess that Mom lived there in a small portion of an apartment or maybe the addresses have been renumbered since. Leon explained to me, in his best French, that during WWII, Arvida was very important to the war effort as it was the most important producer of aluminum in the Western World. The production was so important that it had to be guarded by anti-aircraft artillery, of which my father was an instructor in the RCA. I think that it was during this time that Mom rented a small place in Quebec City. It was also during this time that my second brother was born. According to his military records, Dad may have taken a brief leave of absence and I think he might have travelled to Quebec to be with his family for the birth of his son. The records are not very accurate, however, as they state my brother was born in July, when I know his birth date is in late June 1944. Leon did warn me that military records are not always very accurate. 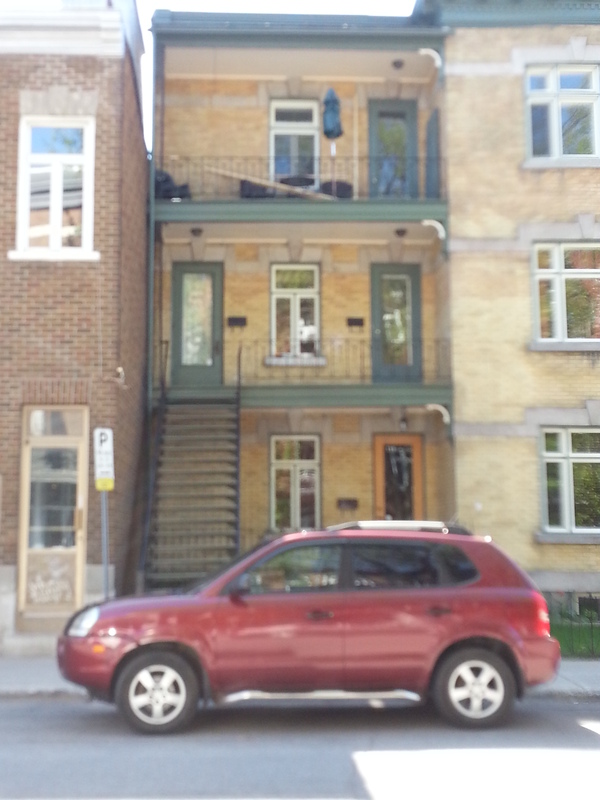 We then moved closer to Old Quebec, on Aberdeen Street, where the military records showed as the residence of his new next of kin, my mom. From the addresses, 99, 105 and 105 1/2 Aberdeen, I figured they had lived in apartments belonging to my maternal grandmother. What a shock when we arrived and found that none of these addresses exist!! 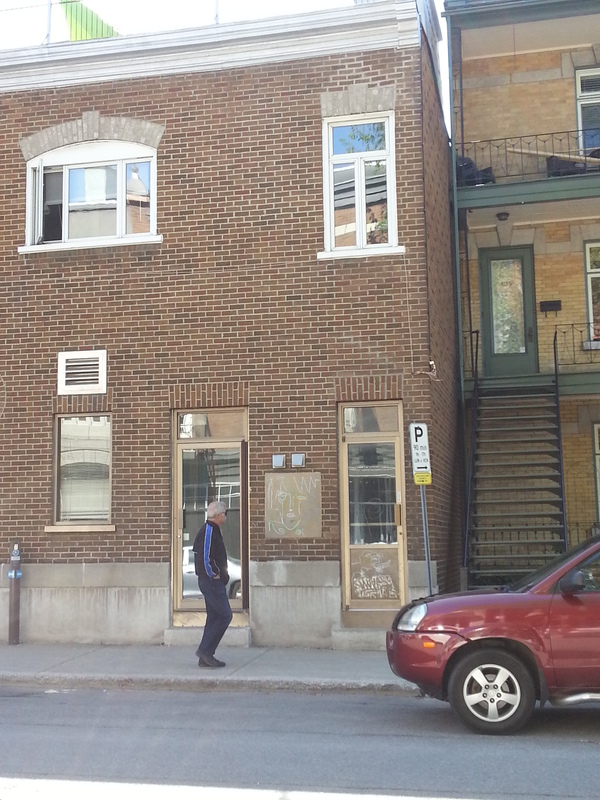 It looks like the one half of a duplex was cut off and appended to a commercial building on the street corner (Cartier). I walked up and down and behind that street and couldn’t get over it!! I settled on thinking that the house must have passed to one of my cousins or uncles after my grandmother’s death and they had sold it. I couldn’t wait to tell my brother Phil!! He would be shocked too. Or maybe he already knew about this? We are looking for 105 Aberdeen. Is this where 99 and 105 Aberdeen where? After the disappointment on Aberdeen, we stopped for a cup of coffee on Cartier street, which is in a great trendy area. The coffee was less than stellar. Perhaps the barista was inexperienced? Back in the camper we drove to our last stop in the lower town area of Old Quebec – Place Royale. 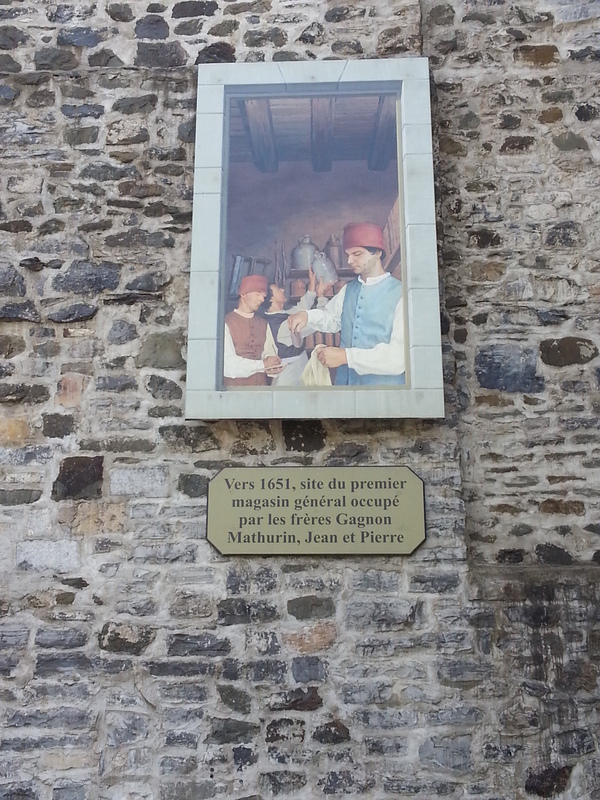 Leon had read on the internet that there was a mural in the old city marking the original Gagnon store (from 1640s or 1650s). Although I have walked in that area many times, I never noticed the mural before. It took a few tries but we finally located it beside the UNESCO park just below Place Royale. Time for a few pictures and we were off in the camper to return to Ottawa. 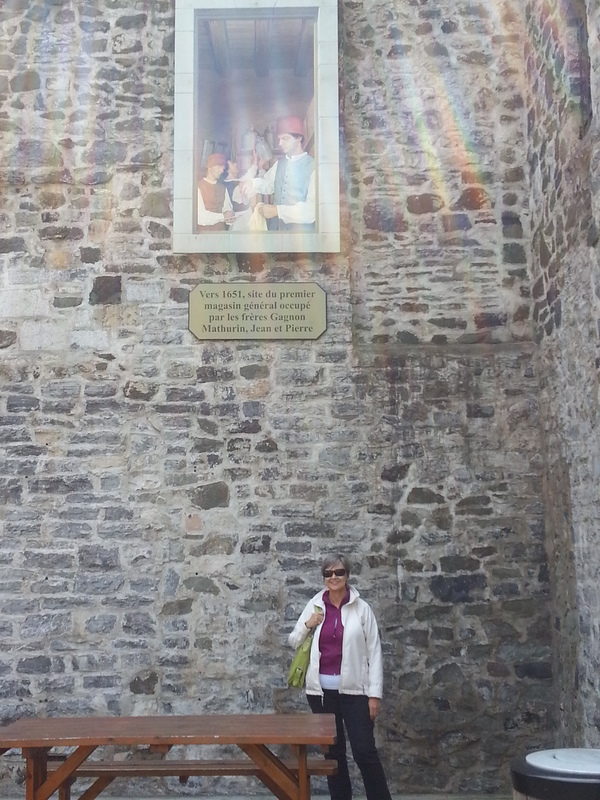 The plaque in Old Quebec City where the original store stood. 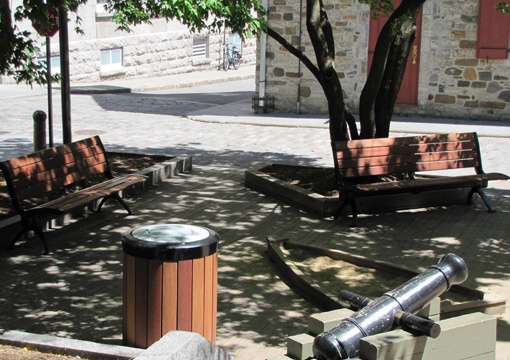 Hi Catherine — I stumbled over your blog when doing research on Aberdeen St. in Quebec City. The answer to your problem may be simple: at one point the city reworked the numbering of the street. The house I lived in was at 23, and it became 55. The numbers of the houses you’re looking for were probably changed too. Oh thank you! My older brother is going to have to show me the exact house where my grandmother lived as I can’t remember it well enough. Thanks again! Pingback: Family Day weekend in Quebec City | Turning my world upside down! I hope to make this kind of trip to Canada one day! It’s wonderful that you have the chance to walk in their footsteps. I discovered in my research that my great-grandfather was Canadian. In fact, until then, I thought the family came straight from the British Isles. Turns out I had three generations of grandfathers and many other relatives there! I have addresses for Hamilton and Kingston, Ontario, and hope to do a trip like your’s in the future! How exciting! Sounds like they were loyalist (loyal to the British Crown). Perhaps they were involved in the War of 1812? Rewarded by the Crown for their good service? At any rate, Kingston is a lovely place to visit. I love how it sits on Lake Ontario, where the lake meets with the St. Lawrence. Not sure about being loyalist or War of 1812, but you have just given me something else to look into, as this might be a real possibility! 🙂 I’ve learned my 4th G-Grandfather Capt. Richard Trowell, was with the Royal Navy in the early 1800’s (my brick wall grandfather). I also discovered through many historical documents from Google searches on my 3rd Great, Capt. John Trowell and his son Capt. John Valentine Trowell, are both noted seaman of the Great Lakes. I even found a picture of Capt. John Trowell! It now sits on my mantel. I’ve always heard stories of “A” Captain in our family…so far I have found three! lol I really need to make the trip to Canada in the next year or two! Wow! You are really making progress. I am having trouble finding occupations of my ancestors. I would have to buy a membership to Ancestry.com to be able to view documents such as electoral lists. I’ll get to it at some point. Having pictures is also terrific. Let me know when you update your genealogy page. I am not sure I subscribe to that, so I can subscribe next time I visit. Will do. I also find documents on FamilySearch.org. It’s free! Hi Sue, and welcome! It is easy to spend quite a bit of time going down memory lane when you write a blog. I spent a good moment on Saturday doing just that. Leon and I are well and trying to lose a few kilos in the constant struggle to stay healthy. We’ve been using myfitnesspal.com to keep track of our calories and it is helpful. Earl is working during the summer months at the local coffee place, Tim Horton’s. He is taking professional writing at college; he has another year or so to go. Ariane is also working, at a spa, and plans to complete her studies in Theater at uni this December. As for me, we are almost done another school year. Last day of school is June 28. We will be travelling all summer and then I’ll be looking at applying for another exchange. Perhaps Australia, perhaps Europe, but likely closer to a beach than Bendigo. I think of my Aussie mates often and miss so many things about our life there, yes, even CCB. 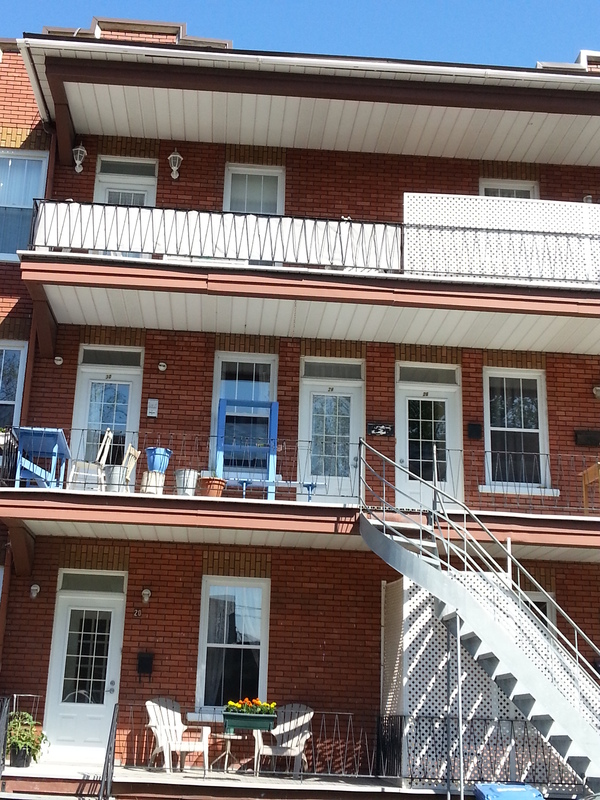 Could they have changed the three floor apt building into a duplex over the years???? Well, that’s what I thought, but my brother assures me that no. I will have to sit with him and discuss this. I looked over the military records thinking they might be in error. But the addresses are referenced over and over. So I can only conclude that the houses have been renumbered over time. I’ll have to see if I can find the city records of ownership to find my grandmother’s property. This would be so much easier if I had thought to ask my own mother these things before she died. Sheesh! !